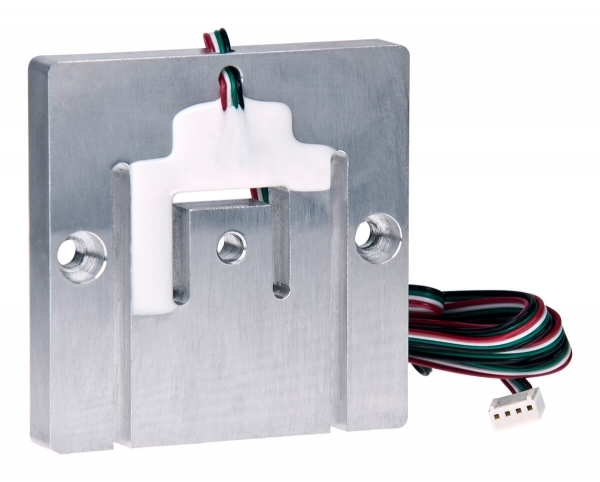 Product information "Planar beam - Load cell P20A"
The planar beam load cells were developed as a low-cost solution for scales with a low construction height and that have virtually any dimensions. The load cell type P20A is a very compact and low-profile planar beam load cell, made of aluminium. The unique design enables the construction of scales with an extremely low overall height. Its special design, with wing-like mounting arms simplifies the installation and ensures optimal functional properties in every weighing system. The use of 3 or 4 load cells is an alternative to the customary single point arrangement, and offers the advantage of a virtually unlimited platform size. A 4-wire flat-ribbon cable with one connector enables fast assembly. Bathroom scales, medical scales, flat compact scales, table scales, floor scales, sales scales, counting scales, as well as special applications in medical technology and other fields. Related links to "Planar beam - Load cell P20A"
Our comment on "Planar beam - Load cell P20A"